Desks for Ethiopia is a report of simple solutions to simple problems. Recently, during a trip to Ethiopia, ET Learns founder Bill Graff saw a problem at Woffa K-8 school. Roughly a quarter of the students sat on the dirt floor during class! The Offa School is located in a rural part of Ethiopia and has no power or water. To assist the education of these students and enable them to reach their potential, we set out to change the situation. Raising over $500, we donated 25 desks to the classroom. These desks were assembled by locals, keeping all the money within the local community. 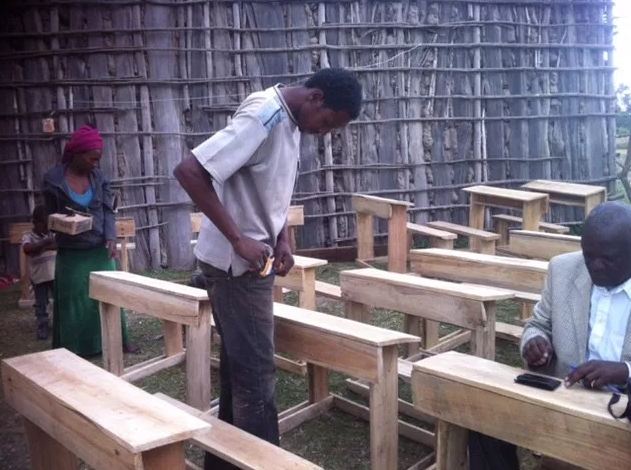 “THE DESKS ARE FINISHED, THE DAY BEFORE YESTERDAY I WENT THERE WITH MR. TADIWOS, THE PRINCIPAL OF THE OFFA SCHOOL. THEY ARE NOW WAITING FOR US. NOW IT WILL SOLVE THE PROBLEMS OF MORE THAN 75 STUDENTS, THAT IS 3 OR 4 STUDENTS PER DESK. THANK YOU. EVERYONE IN THE COMMUNITY ARE [SIC] VERY HAPPY AND THANKING YOU A LOT.